When the weather outside is frightful, I often go hatless to preserve my coif or forego gloves in order to hold hands with my sweetheart. But while in Boston, scarf and I were inseparable. There is something special about an article of clothing which impedes cold drafts and bitter wind from finding their way down the collar and into your bones, don’t you think? And as we saw in the previous post, it can add spice to an otherwise boring (often monotone) pile of layers. 1) A single loop around the neck is a virtually effortless way to look chic in your small to medium sized neckwear. (Up ahead you will see how longer, wider scarves worn this way might overpower an outfit.) 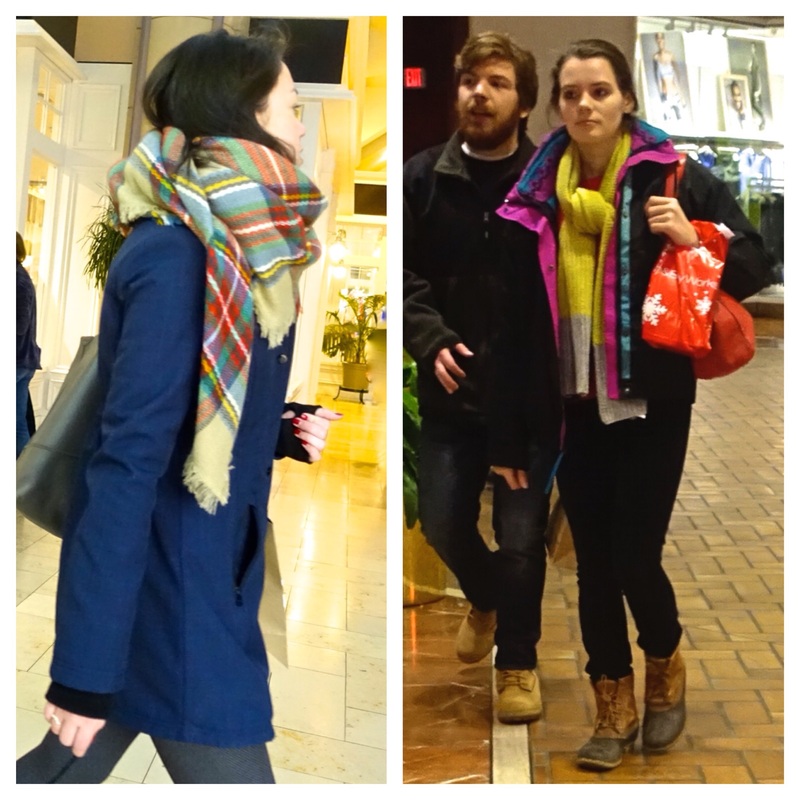 I love how the scarves’ colors brighten our muses’ ensembles and draw attention upward to their faces. 2) The simple (aka European) loop is just as the name suggests. 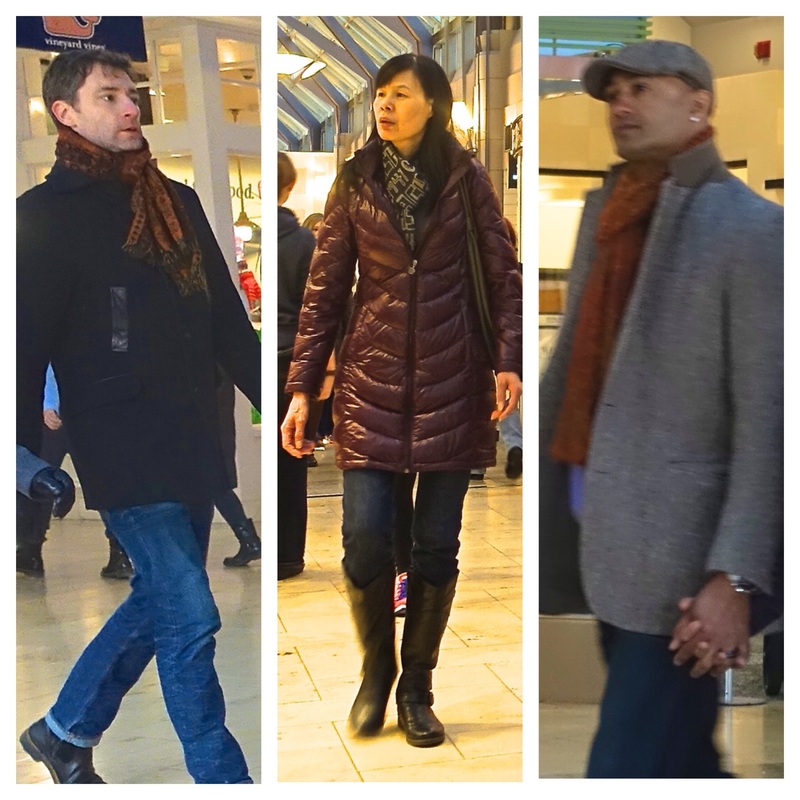 In order to produce this cool and stylish knot, simply fold a long scarf in half, wrap it (doubled) around your neck and pull the two loose ends together through the loop on the other side. You can either tuck in the ends or allow them to hang for a more vertical (read: slimming) line. 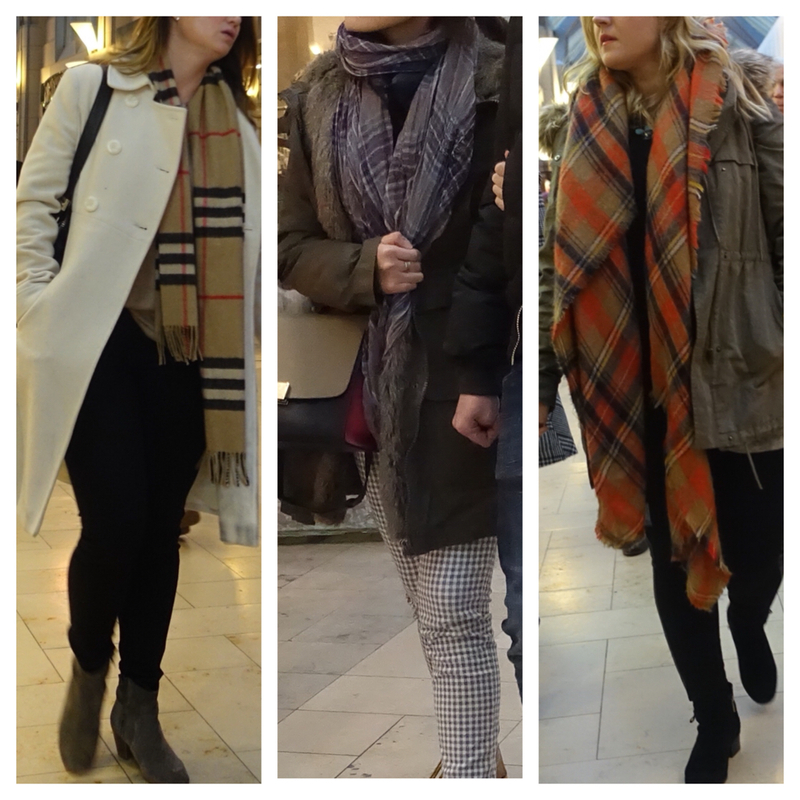 3) My favorite way to wear a thick scarf in winter (for maximum warmth!) is to wrap it around my neck like a bandage. 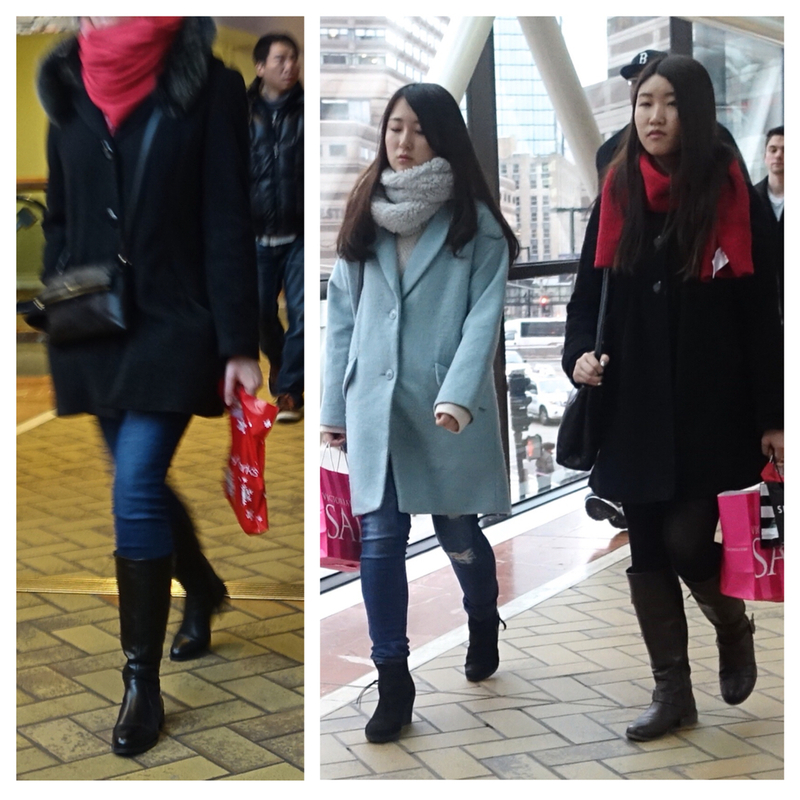 With an infinity scarf, you can just double the loop. I must confess that I am addicted to keeping my neck warm, even right this minute in 63 degree California weather. 4) Do make sure you do something with a thick winter scarf instead of just letting it hang like a blanket (S-L-O-P-P-Y). The woman on the far right is at least a little more creative. A European loop – achieved by pulling the two loose ends on her right through the loop on the other side – would look considerably more polished. The muse to the right does well to loop her scarf around the neck. Doing so a second or third time would be even better, don’t you think? 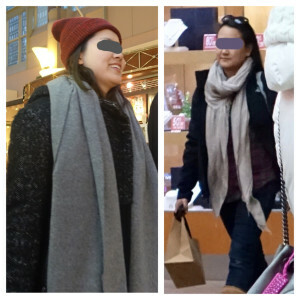 While a long scarf lengthens the silhouette, it can overpower the look and create a sense of imbalance if too long, thick and wide. 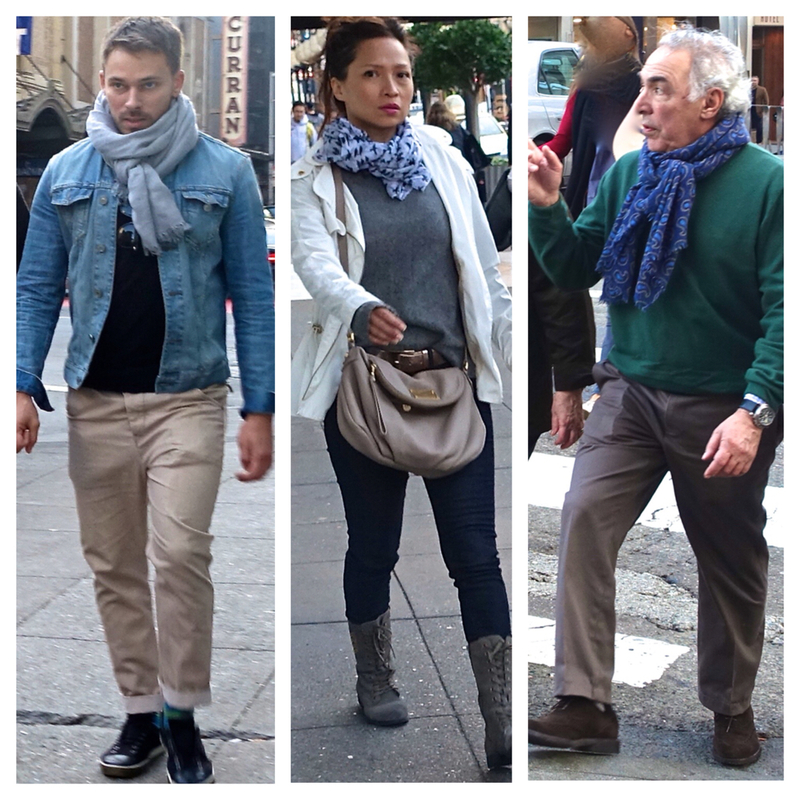 5) Why not just go crazy creative with your scarf? The results are bound to top the scarf-as-blanket look. The photo below and to the left seems to feature the “celebrity knot” illustrated in a great how-to video by Nordstrom. Even the most ordinary knot can work, as seen on the muse to the right. 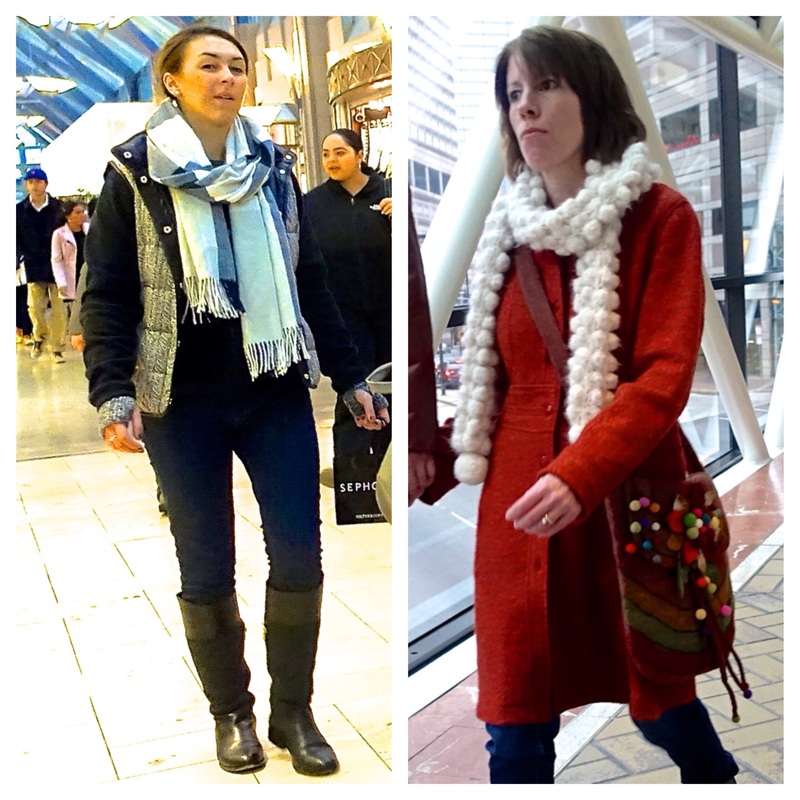 6) A milder climate does afford one a few more scarf wearing options. When one isn’t concerned with the business of fending off hypothermia, a thinner scarf lends itself to more interesting ways of twisting and knotting. 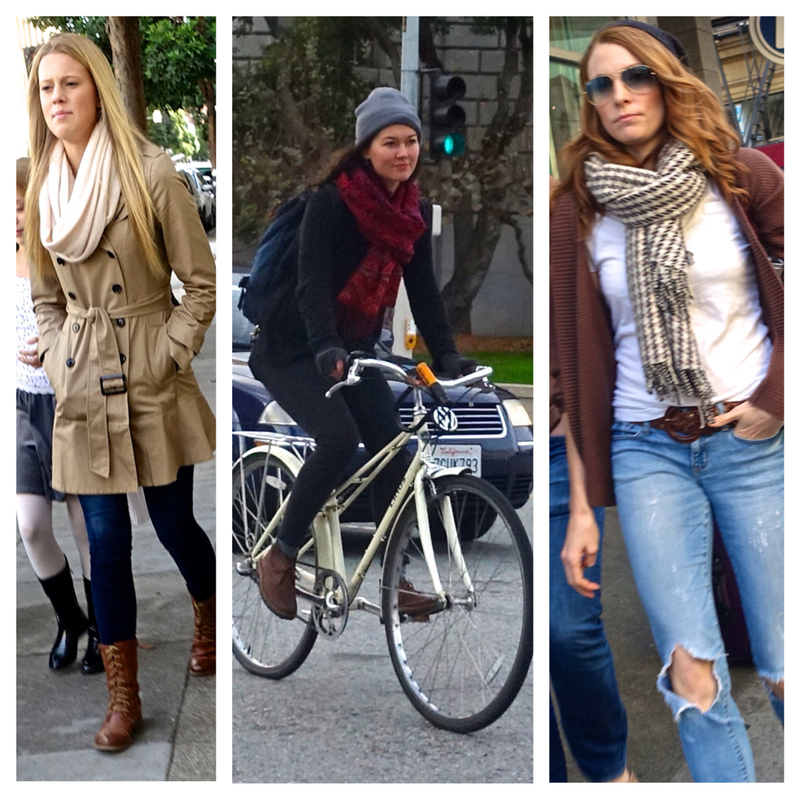 Check out below some awesome scarf wearing I’ve spotted in San Francisco. 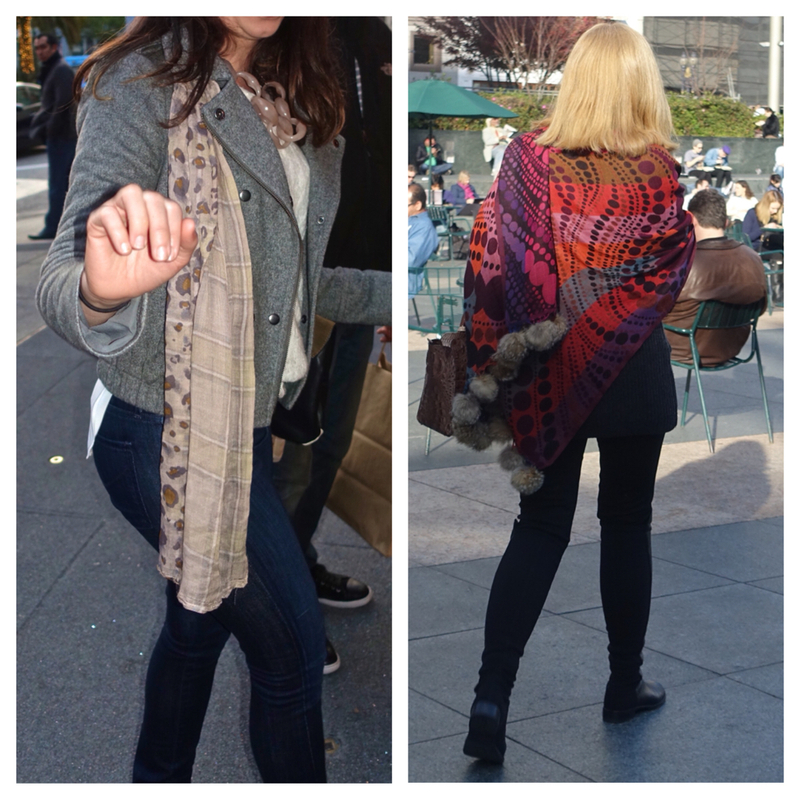 The lightweight scarf to the left looks great simply dangling, don’t you think? 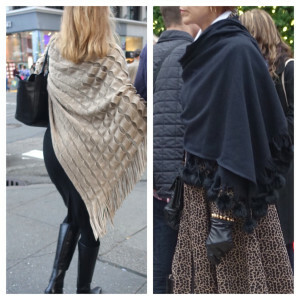 With lighter layers, the scarf/wrap to the right is also stunning. 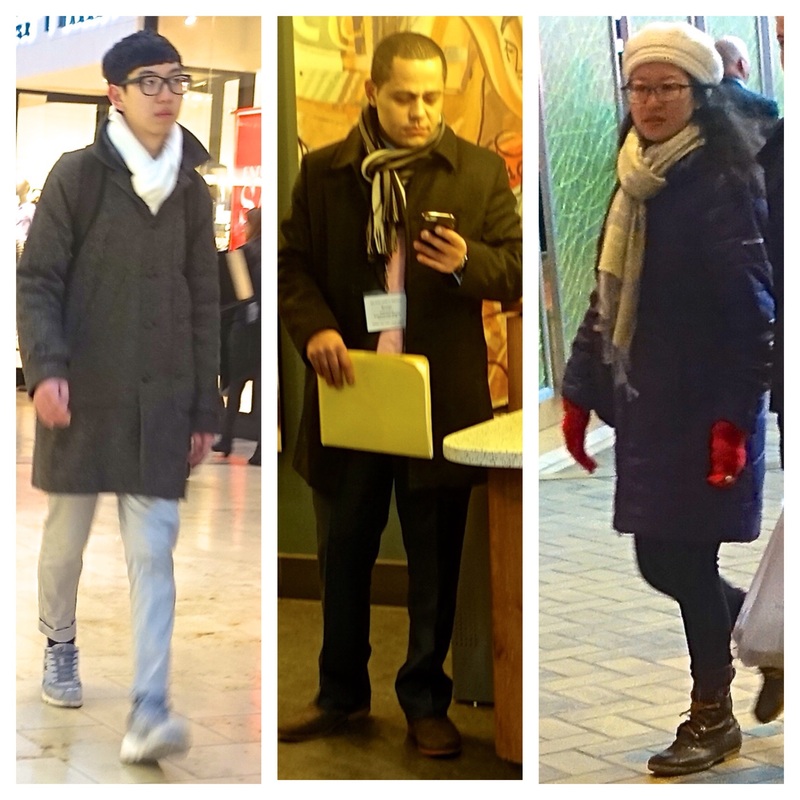 While a scarf is definitely necessary equipment for facing the cold, harsh New England winter, it also allows an opportunity to express your style while piling on the clothes. It can especially add interest and color when paired with the all-black New England winter “uniform” mentioned in my last post. After taking a look at some examples from gelid Boston and more temperate San Francisco, I hope you’ll be inspired to create some new ways of putting a twist on your winter wardrobe.